The reception President Trump received in two European countries during his foreign trip could not have been more different. In Poland he was greeted by cheering crowds, and chants "USA, USA." Next door in Germany, host to the G-20 summit in Hamburg, mobs of demonstrators clogged the streets, destroyed property and hurt people---in fact our First Lady was detained in their guest house for her personal protection. How all this is being defined here at home also defines 2 very different Americas. By all accounts, conservatives are saying President Trump's speech in Warsaw was the best he has given in his young presidency. People who study such things say it reminded them of President Ronald Reagan---particularly his speech in Berlin 30 years ago--- in its clarity, boldness and content. Heritage Foundation's "The Daily Signal" said, "Trump's speech was superbly crafted and rich in historical context, and it was a firm commitment to the freedom and prosperity...What Trump said every Pole could understand...The speech was reminiscent of President Ronald Reagan's speech in Berlin 30 years ago, in which he challenged the Soviet Union leader Mikhail Gorbachev, 'tear down this wall'." These comments reflect those of most all conservatives--- commentators and columnists. Christians in Poland, the US, and around the world were deeply moved by the president's clear commitment to Christianity. I wrote about the content of his speech this past Friday. If you have not read it, please do. It includes a full text, and a video of the speech. Meanwhile next door in Germany, all hell broke loose---directed at the president and our country. Demonstrators were carrying signs that read, "Welcome to Hell." It was unclear to many who were there exactly what the signs meant---was it a hope that it would be the way Chancellor Merkel would treat Trump because of his pulling out of the Paris climate agreement, or was it how they feel about their own country? Based on the broader response to President Trump in Germany, I think it had more to do with Trump then than the current condition of their own country. Local media was reporting that First Lady Melania Trump was detained by the safety officers for a period of time in the guest house the Trumps were staying in because of the threats by demonstrators. The German media also reported that the Hamburg hotels had put up "all occupied" signs, denying the US president accommodation, while some were blaming the president's team for not having made reservations in time. Significantly, at least in my mind, while President Trump was giving his speech in Warsaw, German Chancellor Merkel-- at the same time-- was telling Germany that their country could "no longer rely on America." Indeed, a tale of 2 Europes. It's pretty clear who are our friends and who are our foes. A very divided Europe. One Europe seeks freedom and spiritual meaning, while the other staggers down the destructive path of socialism, globalism and secularism. Trump's trip also tells a tale of 2 Americas. Most conservative leaders are hailing his speech as a defining moment, some referring to it as "the emerging Trump doctrine." In fact, Breitbart News published an in depth article titled, "A Defense of the West and Judeo- Christian Civilization." They note, "Trump really laid it on the line; It's all about the defense of the West. We will not only stand up for our Judeo-Christian civilization, we will also, if need be fight for our Judeo-Christian civilization." However, the so-called "elites" in America saw and heard something very different. The far left "Atlantic" said, "The west is a radical and religious term. To be considered Western, a country must be largely Christian (preferably Protestant or Catholic) and largely white." Therefore Trump's speech was racist? If we believe in who we are, we're racist? Peter Beinart, who wrote the article for The Atlantic, said, "The fundamental question of our time is whether the West has the will to survive" and the speech "only makes sense as a statement of racial or religious paranoia." Beinart is drawing from an old tired belief dating back to Karl Marx. Biblical conviction and wisdom is not paranoia. Jeet Heer, writing for the New Republic, called Trump's address an "alt-right" speech in a commentary titled, "An International Brotherhood of White Grievance." He likened Trump's ideas to those of Pat Buchanan, adding, "Such rhetoric is meant to conjure blood-and-soil nationalism. Here, Trump is defining the West not based on ideals like democracy and liberty, but atavistic loyalties to territory and shared kinship." 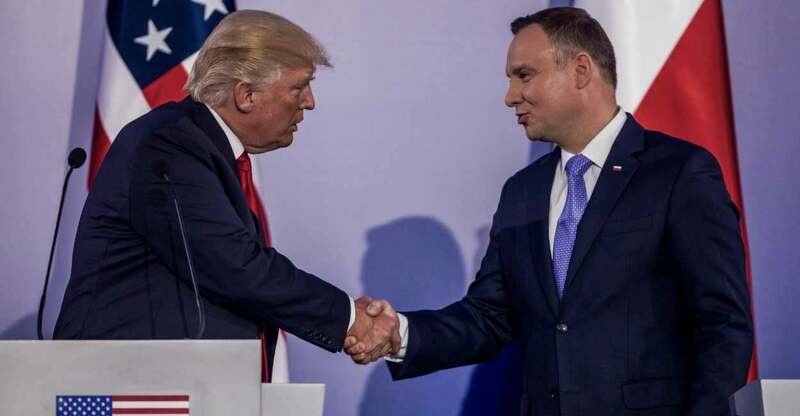 And he explained that Trump's implication is "that American progressives, in their effort to expand the government's influence on society, are the modern-day counterparts of the communists that threatened Poland." This is, in a nutshell, the secular worldview with man at the center---standing in direct opposition to a biblical worldview which places God and His Word at its center and embraces His model for society, including national borders as outlined in Genesis---borders, language and culture---which the book of Acts explains works in harmony with God's purposes to reach out to all people with His redemptive message of eternal life. The West has flourished---particularly America, because God's laws were the foundation of the culture and society. In their times both Ronald Reagan and, before him Franklin D. Roosevelt, said in their own way, we cannot escape this "rendezvous with destiny." Donald Trump phrased it this way: "The fundamental question of our time is whether the West has the will to survive? Do we have the confidence in our values to defend them at any cost? Do we have enough respect for our citizens to protect their borders? Do we have the desire and the courage to preserve our civilization in the face of those who would subvert and destroy it?" The Bible tells those of us who have linked our destiny to God and His Word to "Cast not away our confidence..." Stand strong on His Truth. The secular progressive worldview is based on relativistic values---ever changing and evolving. The biblical worldview is based on eternal Judeo-Christian values that never change. And absolute Truth. Upon which foundation should one build? Sand? Or the Rock? The battle rages and each nation has a date with destiny. So do each of us individually. The ultimate answers are not political, but it sure helps to have someone in the most powerful office in the world who understands that there is a battle.
" For we do not wrestle against flesh and blood, but against principalities, against powers, against the rulers of the darkness of this age, against spiritual hosts of wickedness in the heavenly places" (Ephesians 6:12). Be Strong. Be Vigilant. Be Prayerful. Be Thankful. Been a long time since I was in school, but I thought Europe was the west. I always appreciate your articles, especially when you reference scripture. Will you state the verses that teaches the borders, langauge and culture please? [ The Tower of Babel ] "Now the whole world had one language and a common speech." At Babel, there was a move toward Mankind taking over power and becoming one world order. God broke people into different groups, which formed different countries to combat this. It is too easy for one single government to achieve incredible evil, so many governments were created. There exists a common thread between the interests of Chancellor Merkel and ex-president Obama, the destruction of their respective countries as free Christian nations.